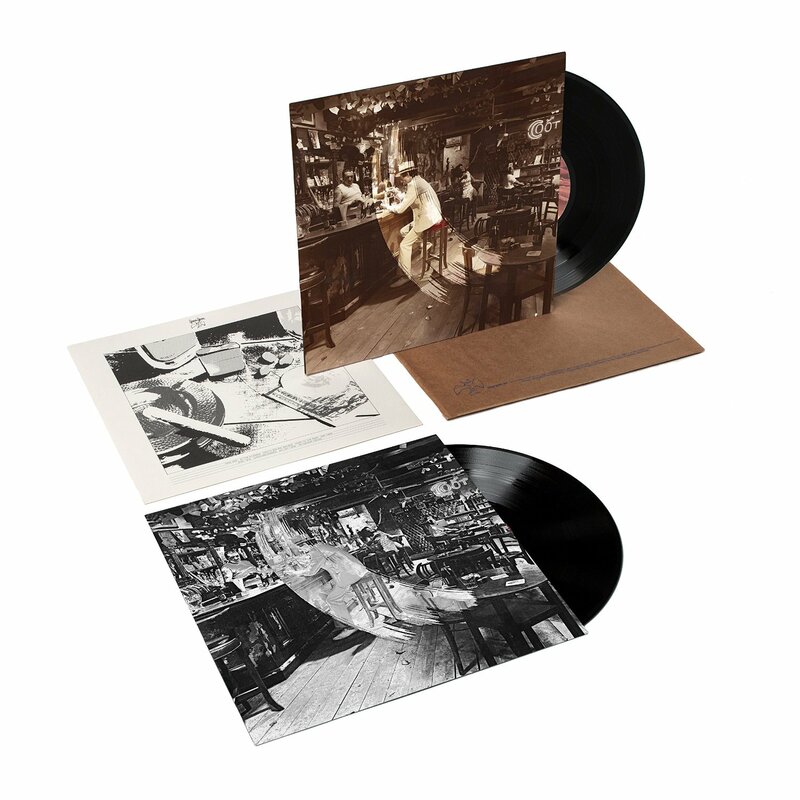 LED ZEPPELIN-IN THROUGH THE OUT DOOR-DELUXE VINYL EDITION. On 15th August 1979, Led Zeppelin released their eighth studio album In Through the Out Door. By then, they were one of the biggest selling bands in the world. Their first seven studio albums and their 1976 live album The Song Remains The Same, had sold eighty-three million copies in America alone. Worldwide Led Zeppelin’s albums had sold over 100 million copies. However, little did the four members of Led Zeppelin realise that In Through the Out Door, which was recently reissued on vinyl as a double album, marked the end of an era. In Through The Out Door was the last album to feature the original lineup of Led Zeppelin. Not for the first time, tragedy was about to touch Led Zeppelin. Things hadn’t been going well for Led Zeppelin since the 5th August 1975. Before Led Zeppelin embarked upon an American tour, Robert Plant decided to take his family on holiday to Rhodes. Robert decided to hire a car so he could see the Island. Disaster struck on 5th August 1975, when the car spun off the road and crashed. He was taken to hospital where doctors discovered that Robert had broken his ankle and elbow. This resulted in the American tour being postponed. With the American tour cancelled, Robert Plant began the lengthy period of recuperation. His convalescence began in Jersey, where Robert began writing some of the lyrics for Presence. When Robert moved Malibu, he continued to write the lyrics for Presence. By then, he was joined by Jimmy Page. The pair began to knock the lyrics into shape. Soon, the Page and Plant songwriting partnership had enough material for an album. and Robert’s recuperation looking like being lengthy, he he decided to write the lyrics for Led Zeppelin’s next album. This made sense. However, with Robert confined to a wheelchair, it wasn’t going to be easy for him to record his vocals. Despite this, the early recording sessions for Presence took place at Hollywood’s SIR Studio. That’s where they spent the next month, working on the songs that became Presence. After a month, Led Zeppelin flew to Giorgio Moroder’s Musicland Studios, in Munich, Germany, which was perceived as the studio to record an album. Led Zeppelin were just the latest to make their way Musicland Studios. As Led Zeppelin setup, onlookers something was missing. John Bonham’s drums and percussion were present. So were John Paul Jones four and eight string basses. Jimmy Pages’ array of guitars were setup in his corner of the studio. All Robert Plant brought was his trusty harmonica. Then it became clear what was missing, keyboards. It looked like Led Zeppelin were going to record an album without keyboards. That’s what Led Zeppelin proceeded to do. Presence Plant and Page decided, should mark a change in Led Zeppelin’s sound. This should make Led Zeppelin’s return to hard rock. The riffs were much simpler, as Led Zeppelin moved towards guitar based jams. This was very different to some of the complex arrangements on Physical Graffiti. Another change was the lack of keyboards. Originally, they were meant to be absent. However, it was a case of needs must. Keyboards had to be used for the chorus on Candy Store Rock. Mostly, though, Presence was a much more stripped back, simpler and spontaneous album than previous Led Zeppelin albums. There was a reason for this. Led Zeppelin had to work quickly. The Rolling Stones were scheduled to record Black and Blue. So, Led Zeppelin had to work quickly. They laid the tracks down quickly. There was an element of spontaneity in the sessions. Once the tracks were laid down, three nights were spent adding overdubs. By the 25th November 1975, Led Zeppelin’s yet unnamed album was recorded and mixed. It hadn’t been the ideal sessions for Led Zeppelin. Usually, Led Zeppelin would spend much longer than eighteen days recording an album. However, they were against the clock. If the album wasn’t recorded in time, Led Zeppelin would have to find another studio. They were determined not to have to do this, so they spent eighteen to twenty hours a day recording. Sometimes, members of Led Zeppelin fell asleep while mixing the album. Whoever was left awake, was left to mix the track. Somehow, Presence was recorded the album in eighteen days. Later, Robert Plant felt this showed. With Robert Plant confined to a wheelchair, this made delivering his trademark vocals difficult. He couldn’t unleash the same power. As a result, Robert later though his vocal was “pretty poor”…and “sounds tired and strained.” Robert also felt “claustrophobic” as Led Zeppelin recorded in Musicland’s basement studios. He was also still suffering from the accident that happened three months earlier. Despite this, Robert soldiered on and the Presence sessions were finished on time. Somehow, Led Zeppelin had managed what many thought was impossible, and recorded and mixed an album in eighteen days. It was ready for release in early 1976. Before Presence was released on 31st March 1976, critics had their say about Led Zeppelin’s latest album. Previously, many critics hadn’t been fans of Led Zeppelin. It didn’t matter that they were one of the most successful bands in the world, certain critics enjoyed panning new Led Zeppelin albums. So, it was no surprise that Led Zeppelin tended to avoid the press. No wonder. Just like previous albums, Presence wasn’t well received by critics. Some critics remarked that the songs were all similar. Gone was the diversity of previous albums. Other critics called Presence inaccessible, and a difficult album to like. While Led Zeppelin had had bad reviews before, this didn’t bode well for the release of Presence. Presence wasn’t released until 31st March 1976. The album had been delayed while the sleeve was completed. By the time Presence was released, it had racked up the highest ever advance orders in Britain. This resulted in Presence reaching number one and being certified gold upon its release, and later, was certified platinum. Across the Atlantic, Presence eventually reached number one in the US Billboard 200. It was the slowest selling of Led Zeppelin’s seven album career. Eventually, Presence sold just three million copies, and was certified triple-platinum. Considering Physical Graffiti had sold sixteen million copies, Presence was seen as a failure in America. Elsewhere, sales of Presence were slow. In Australia, France, Japan, New Zealand, Norway, Spain and Sweden, Presence entered the top ten. Presence didn’t sell as well in Canada, where Led Zeppelin had always been popular. Gold and platinum discs were in short supply. Apart from Britain and America, Presence didn’t sell enough copies elsewhere. Nor did the single released from Presence. Candy Store Rock was chosen as Presence’s lead single. It was perceived as one of Presence’s highlights. However, it failed to chart in any of the countries it was released in. For Led Zeppelin, Presence was a disappointing album commercially. Especially given Led Zeppelin were at the peak of their powers. What was even more galling was that Led Zeppelin were unable to tour. If they had headed out on tour, maybe sales of Presence would improve? Given Robert Plant’s injuries, this wasn’t possible. So Led Zeppelin decided to complete the concert film The Song Remains The Same. Ever since late 1969, Led Zeppelin had been planning a documentary film about the band. A performance was filmed at the Albert Hall in London, on 9th January 1970. However, the sound quality wasn’t satisfactory, so the idea was shelved temporarily. Then on 20th July 1973, Led Zeppelin’s manager Peter Grant made contact with actor and director Joe Massot. He had previously filmed George Harrison’s Wonderwall. Joe was a friend of Peter Grant, and Jimmy Page. So when Peter Grant approached Joe about filming Led Zeppelin, he didn’t take much convincing. A month later, Joe was in New Your filming Led Zeppelin. On 27th, 28th and 29th July 1973, Led Zeppelin were playing at Madison Square Garden. The three nights were filmed on 35mm film with a twenty-four track quadraphonic mobile recoding studio. This cost $85,000, which the four members of Led Zeppelin financed. After the three shows at Madison Square Garden, progress slowed. This didn’t please Peter Grant. He decided to bring another direction onboard Peter Clifton to complete the project in July 1974. So, Peter Grant sent someone to Joe Massot’s house to collect the film. Joe Massot however, was owed money, and decided to hide the film. This he thought would ensure he was paid. Instead, Joe’s editing machine was taken as collateral. Before long, it was stalemate and Joe served a writ. Once the writ had been served, Led Zeppelin’s lawyers paid Joe Massot the money he was owed. He delivered the films, and Peter Clifton was given the job of completing the film.This included Led Zeppelin recreating the Madison Square concerts at Shepperton Studios in August 1974. Eventually, The Song Remains The Same was completed after three years work. A premiere of The Song Remains The Same took place at Atlantic Records. The label’s founder and president, Ahmet Ertegun is reported to have fallen asleep during the screening. This didn’t bode well for the release of The Song Remains The Same. On 20th October 1976, the film and soundtrack to The Song Remains The Same was released. Critics weren’t impressed with the soundtrack. They felt the album was over-produced, clumsy and awkward. Even the four members of Led Zeppelin weren’t fans of The Song Remains The Same. Jimmy Page felt that The Song Remains The Same: “wasn’t necessarily the best live stuff we have. I don’t look upon it as a live album…it’s essentially a soundtrack.” Given the subsequent recreating of the Madison Square concerts and subsequent, there’s more than an element of truth in this. However, record buyers had the casting vote. When The Song Remains The Same was released, it reached number one in Britain and number two in the US Billboard 200. Elsewhere, The Song Remains The Same reached the top ten in the album charts in Canada, Japan and New Zealand. The Song Remains The Same was certified gold in France and Germany, platinum in Britain and four times platinum in America. With around five millions sales, The Song Remains The Same had been a success for Led Zeppelin. However, 1977 proved to be the most difficult years of Led Zeppelin’s career. With Robert Plant fully recovered, Led Zeppelin were ready to embark upon their American tour. Things however, didn’t go to plan. In February 1977, Robert Plant was diagnosed with laryngitis. This resulted in the opening date being postponed from February to April 1977. This further impacted upon ticket sales. When Led Zeppelin announced their 1977 American Tour, the tickets sold well. However, they didn’t sell in the same quantities they had two years earlier. Back then, Led Zeppelin were at the peak of their popularity. Two years later, Led Zeppelin tickets weren’t selling as well. The postponement impacted upon the band. With Led Zeppelin’s equipment being shipped to America, the band had no equipment to practice with. For a month, Jimmy Page never picked up a guitar. So when Jimmy played the first few shows, he stepped on-stage with a degree of trepidation. However, the shows went to plan, until Led Zeppelin reached Cincinnati. Two months later, in June 1977, Led Zeppelin were due to play in Tampa. The concert began, but didn’t finish. A thunderstorm forced the cancellation of the concert. Then the following month, Led Zeppelin were embroiled in controversy. On 23rd July 1977 Led Zeppelin were playing in Oakland, California. The concert was promoted by Bill Graham. After the show, Led Zeppelin’s manger Peter Grant lead a group, which included John Bonham. They badly beat up one Bill Graham’s employees. This was just the latest example of darkness descending during the 1977 American tour. However, the events of three days later meant everything else paled into insignificance. A couple of days after the events at Oakland, Robert Plant’s five year old son Karac contracted a stomach infection. Then on the 26th of July 1977 came the news, Karac Plant had died. His death was sudden and came without warning. Robert Plant was totally distraught. He struggled to come to terms with the death of Kovac. Following the death of Kovac, Robert Plant returned home. He was struggling to cope. The press and media covered the story closely. All Robert wanted to do, was be around his family. John Bonham proved supportive of Robert. Music no longer interested Robert. At one point he applied, and was accepted for a career in education. Led Zeppelin it seemed were history. So it appeared were drugs. Before the death of his son, Robert Plant, like the rest of Led Zeppelin lived the rock ’n’ roll lifestyle. They were regarded as one of the hardest living bands in rock music. Ever since the early days, Led Zeppelin were one of the hardest living bands in rock music. They embraced the rock ‘n’ roll lifestyle. Especially on tour. Led Zeppelin lived the rock ’n’ roll dream. Drink, drugs and debauchery was commonplace. So was destruction. The four members of Led Zeppelin weren’t averse to wrecking hotel rooms. Having trashed a room in the Tokyo Hilton, Led Zeppelin were banned from the chain for life. Hotel rooms weren’t just trashed. Television sets out of hotel windows. Another time, John Bonham rode a motorcycle the Continental Hyatt House, which Led Zeppelin nicknamed Riot House. However, it wasn’t just on tour Led Zeppelin embraced the rock ‘n’ roll lifestyle. When neither touring nor recording, Led Zeppelin lived the life becoming a rock star. Members of Led Zeppelin lived in mansions, drove fast cars and in Robert Plant’s case, flamboyant clothing and expensive jewellery. Robert Plant was every inch the rock star. He enjoyed the finer things in life, including holidays to the most glamorous of destinations. Robert Plant planned to give all this, and the rock ’n’ lifestyle up. Later, Robert Plant claimed that following the death of his son, he quit the various drugs he was taking. Robert eschewed treatment, and went cold turkey. However, by the time Led Zeppelin began recording In Through The Out Door, he was addicted to heroin. In Through The Out Door. Sixteen months after the death of Robert Plant’s son, Led Zeppelin returned to the studio in November 1978. This was exactly three years since Led Zeppelin began recording their previous album Presence. Recording of Presence had taken just eighteen days. This time, Led Zeppelin would spend three weeks in November and December of 1978 recording In Through The Out Door. That’s quite incredible, given one member of Led Zeppelin was an alcoholic, and another a heroin addict. By the time recording of In Through The Out Door began, John Bonham was an alcoholic. while Jimmy Page was addicted to heroin. This resulted in Led Zeppelin being split in two. Robert Plant and John Paul Jones were clean. Although the pair had enjoyed the rock ’n’ roll lifestyle, they were clean. Neither were addicted to drink nor drugs when recording of In Through The Out Door began. They became the driving force of Led Zeppelin. Meanwhile, John Bonham and Jimmy Page became increasingly reliable. This resulted in John Paul Jones playing a bigger role in writing the songs that became In Through The Out Door. Previously, Jimmy Page and Robert Plant proved a formidable songwriting partnership. That’s one of the reasons why by 1977, Led Zeppelin sold over 100 million albums worldwide. For In Through The Out Door, Jimmy Page and Robert Plant only penned one track, Hot Dog. They cowrote In The Evening, Fool In The Rain, Carouselambra and I’m Gonna Crawl with John Paul Jones. South Bound Saurez and All My Love. These seven tracks became In Through The Out Door, which was recorded in three weeks. Gone were the days when Led Zeppelin spent months over an album. Instead, recording took began in November 1978 at Polar Studios, in Stockholm, Sweden. At Polar Studios, Led Zeppelin split in two. Jimmy Page and John Bonham teamed up. Sometimes, one or both of them failed to turn up for recording sessions. This meant that Robert Plant and John Paul Jones had to pick up the slack. Bassist John Paul Jones was a happy man when the sessions began. Keyboards were back on In Through The Out Door. He played keyboards, piano, synths and mandolin. Jimmy Page added acoustic and electric guitars, and deployed his newly acquired Gizmotron effects device. He also produced In Through The Out Door. Recording took three weeks, with Robert Plant and John Paul Jones recording during the day. This allowed Robert Plant and John Paul Jones to tighten songs.However, when darkness descended, drummer John Bonham and guitarist Jimmy Page entered the studio. After three eventful weeks, recording of In Through The Out Door was complete in December 1978. Now the four members of Led Zeppelin could head home for Christmas. Little did they realise that the In Through The Out Door session were their final recording sessions together. Once the holiday season was over, Led Zeppelin’s thoughts turned to their eighth album, In Through The Out Door. Hipgnosis who had designed previous Led Zeppelin albums needed to come up with an album cover. Each of their previous album covers were unusual. In Through The Out Door was no different. Storm Thorgerson Hipgnosis’ inspiration for In Through The Out Door’s album cover came from the bootleg albums which were popular around 1978-1979. Many came wrapped in a plain brown sleeve, with the title of the album stamped on it by a rubber stamp. This Storm Thorgerson and Led Zeppelin decided would be perfect for their eight album. It was entitled In Through The Out Door, which was Led Zeppelin trying to describe what they had been through in the last few years. The last few years had been tough on Led Zeppelin. Obviously, the death of Robert Plant’s Karac son had been the worst experience of this period. However, during this period, Led Zeppelin were tax exiles, and were living far from their friends and family. This was also taking its toll on Led Zeppelin. This meant In Through The Out Door was the perfect description of what Led Zeppelin had been through. Maybe, Led Zeppelin’s luck would change when In Through The Out Door was released? Originally, In Through The Out Door was scheduled to be released before Led Zeppelin played two concerts at the 1979 Knebworth Festival. However, when Led Zeppelin took to the stage on the 4th of August 1979, In Through The Out Door had been postponed. Instead, it was released on 15th August 1979. Before the release of In Through The Out Door, critics had their say. Many of the reviews were poor. Despite this, In Through The Out Door reached number one in Britain and in the US Billboard 200. In Through The Out Door was certified platinum in Britain and six times platinum in America. Across the border, In Through The Out Door reached number one. This was also the case in Australia, where In Through The Out Door was certified platinum. Elsewhere, In Through The Out Door reached the top twenty in Austrian, French, Italian, Japanese, Norwegian, Spanish and Swedish album charts. In West Germany, In Through The Out Door reached number twenty-eight. That wasn’t the end of the commercial success for Led Zeppelin. Not for the first time, Led Zeppelin made history on the week beginning 23rd October 1979. In Through The Out Door, and each of Led Zeppelin’s previous albums charted in the US Billboard 200. Led Zeppelin repeated this feat a week later, on 3rd November 1979. Considering that critics had panned In Through The Out Door, Led Zeppelin were having the last laugh. However, were the critics correct to pan In Through The Out Door? Fool In The Rain marks a change of time signature. Led Zeppelin play in 12/8 time. This gives the song a Latin feel, John Paul Jones’ keyboards are at the heart of the arrangement. At first it’s the piano. The rest of the band play around him. Meanwhile, Robert delivers a deliberate, heartfelt vocal. Later, John Paul Jones flits between piano and keyboards, while a scorching guitar bounds along. Midway through song, the Latin influence becomes more apparent. A myriad of percussion and whistles are deployed, as Led Zeppelin show their versatility, one one of the hidden gems of their discography. Jimmy Page’s guitar is counted in on Hot Dog. Soon, he’s unleashing blistering licks. John Paul Jones adds boogie woogie piano. Meanwhile, the rhythm section drive the arrangement along. Robert’s vocal is a country-tinged vamp. The rest of Led Zeppelin add harmonies, before searing, scorching guitars punctuate the arrangement. This results in country music with a Led Zeppelin rocky twist. As Carouselambra unfolds, synths are to the fore. They’re then joined by crunchy, scorching guitars combine and the rhythm section. They create a wall of sound. It dominates the arrangement. So much so, that it almost overpowers Robert’s vocal. Even the drums are dwarfed by the synth driven arrangement. At one point, the arrangement sounds like a carousel. That’s before this near eleven minute epic charges on, taking a prog rock twist. There’s twists and turns aplenty as Led Zeppelin show their creativity and imagination. Stylistic changes, and changes in tempo are deployed effectively. Similarly, Jimmy Page unleashes some of his best, crystalline licks, despite his battle against heroin. Led Zeppelin were down, but far from out. All My Love sees the tempo drop and synths play a leading role as the song takes shape. The synth is accompanied by drums, chiming guitars and Robert’s impassioned vocal. Again, there’s a prog rock influence on All My Love. It was written in honour of Robert Plant’s son Karac. He delivers a vocal that’s heartfelt and emotive. When it drops out, the synths take charge. Then when Robert’s vocal returns, he combines the same emotion as he delivers a paean to his late son. I’m Gonna Crawl closes In Through The Out Door. Again, the synths opens the song. The tempo has dropped, as the rhythm section and a chiming guitar combine. The drums create a mesmeric backdrop for Robert’s tormented vocal. He’s infatuated and unleashes a soul-baring vocal on this dramatic, rocky ballad. It features another vocal powerhouse from Robert, who in the space of two tracks, shows his versatility as a vocalist. Along with the rest of Led Zeppelin, they take what would be their final bow, on this dramatic, rocky ballad. Little did the four members of Led Zeppelin realise it, but the In Through The Out Door sessions were the last time they would record together. On 25th September 1980 John Bonham was found dead. The previous day, he had drunk the equivalent of forty shots of 40% vodka. The day began, when John was heading for rehearsals, downed four quadruple vodkas. He continued to drink throughout the day. At the end of the day, Led Zeppelin headed to Jimmy Page’s house. When he went to bed, John had drunk 1.4 litres of 40% vodka. Despite putting him on his side, John Bonham was sick and choked on his own vomit. The next day, John Bonham was found dead, aged just thirty-two. In Through The Out Door was his swan-song. In Through The Out Door also proved to be Led Zeppelin’s final studio album. Their final album, Coda which was released in 1982, was a compilation of unreleased tracks. Led Zeppelin’s final album was In Through The Out Door. While In Through The Out Door wasn’t their finest moment, it wasn’t a a terrible album. Especially considering that Jimmy Page was addicted to heroin and John Bonham was an alcoholic. Led Zeppelin dug deep, and came up with an album that sees them flit between musical genres. There’s everything from blues, country, Latin, prog rock and rock. Not just any rock, but Led Zeppelin at their heaviest. Sadly, if In Through The Out Door didn’t feature Led Zeppelin at their hard rocking best, what a fitting finale it would’ve been to the 100 million selling band. Sadly, it wasn’t to be. What put a lot of people off In Through The Out Door was the use of synths. Keyboards had long played an important part in the Led Zeppelin sound. Synths were something that divided opinion. Especially on In Through The Out Door, which was recently reissued by Atlantic Records, on vinyl as a double album. The second LP features an alternative version of In Through The Out Door. It comprises demos and alternate tracks. This will appeal to Led Zeppelin completists. However, whether In Through The Out Door will appeal to newcomers to Led Zeppelin is another thing? They would be better beginning with Led Zeppelin and working their way through Led Zeppelin II, Led Zeppelin III, Led Zeppelin IV, Houses Of The Holy and Physical Graffiti. These six albums feature Led Zeppelin at their hard rocking best, and show just why Led Zeppelin have sold over 100 million albums. Led Zeppelin at their hard rocking best were, and are, one of the greatest bands in the history of rock. Led Zeppelin were at the top for ten years, and their swan song was In Through The Out Door, may not have been their greatest album, but is one of their most eclectic, and shows fleeting moments of their previous genius. ← LOWE COUNTRY-THE SONGS OF NICK LOWE.